Previously, I published that the Missouri State Genealogical Association (MoSGA) is holding their Annual Conference in Columbia Missouri August 1 - 2, 2014. While the conference is offering excellent Keynote and Supporting Speakers as well as Workshops, you may be looking for a little more. Perhaps you want to have an extended visit to learn more about the area your ancestors lived or traveled through. As promised, I am sharing additional items of interest to enrich your visit to this area. 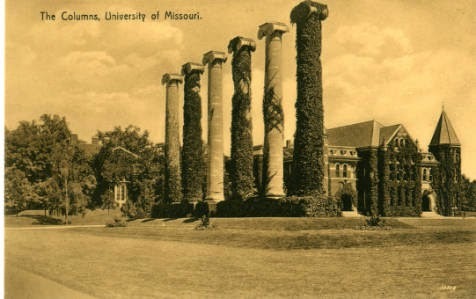 The State Historical Society of Missouri is located in Columbia on the beautiful campus of the University of Missouri. Spend an afternoon learning about their Special Collections and enjoying the Thomas Hart Benton's American Mythologies exhibit.